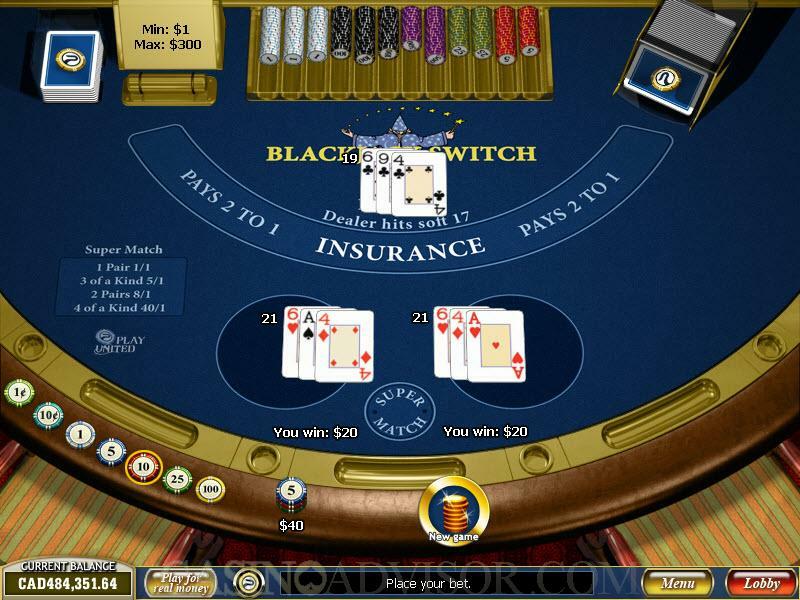 Blackjack Switch is an innovative variant of blackjack. Players play with two hands instead of one. When the first two cards are dealt in each hand, players have the option of switching the second cards so as to improve the standing of both or one of the hands. Blackjack Switch also features a Super Match side bet. The bets are placed by clicking the desired chip denomination and then the appropriate betting area. A separate wager has to be placed for the side bet. The game is started by clicking the Deal button. After the cards are dealt among the options made available to the player is Switch. If players want to switch cards they should exercise this option before any other. The game begins with the wager being placed. Playtech Blackjack Switch allows a minimum bet of 1.00 and a maximum bet of 300.00. After the cards are dealt, the Super Match side bet is first settled. If the four cards dealt contain two or more cards of the same rank then the payout is made as indicated in the payout table. Otherwise this wager is lost. The Switch option has to be exercise first, but is not mandatory. This option should be exercise only if it gives some advantage to the player. The player should increase his chances of winning after making the switch. For example, a player is dealt 10 as the first card and 5 as the second card in one hand and 5 as the first card and 10 as the second card in the other hand. His hand values are then 15 and 15. By switching the second cards the hand values become 20 and 10. This increases the player's chances of winning. In Playtech Blackjack Switch, this benefit does not come without a cost. Some of the rules of normal blackjack are changed in the online casino's favor in order to compensate for this benefit. The game customization options can be accessed through the Menu button on the bottom toolbar. Several options are available in Playtech Blackjack Switch. The player can play in either the full screen mode or Windowed screen mode. The game speed can be adjusted over a continuous range. The player can also disable the dealing animations if he wants to. This further speeds up the game play. The regular sound options are available. One unique customization feature in this game is that the player can enable large card sizes in case he has problems with the regular size. Playtech Blackjack Switch does not offer auto play. Another tab in the menu button that is important is the Help. This leads to a comprehensive document that explains all that there is to know about Blackjack Switch. It explains the game procedures, the payouts and how Blackjack Switch differs from the normal blackjack game. Blackjack Switch is a variant that is available only at Playtech online casinos. Other online gaming software providers do not offer Blackjack Switch. Interested in reading more detailed information about Blackjack Switch? If so Click Here for more details.